Fireplaces in older homes are usually smaller than modern ones, especially in Victorian homes. Opening a fireplace is a simple task, but it is important to keep the foundation intact to prevent it from falling down. A new, broader mantel can also help the fireplace look and feel larger after a few bricks are removed. Always contact a contractor before starting renovation work to assess the foundation of the fireplace and the home. A fireplace adds warmth to a home. Contact your local city office to learn of any regulations or mandated inspections that have to be completed before or after the renovation. Follow the instructions exactly to prevent your project from taking longer than expected. Move the furniture located close to the fireplace to another room, or cover with old sheets. 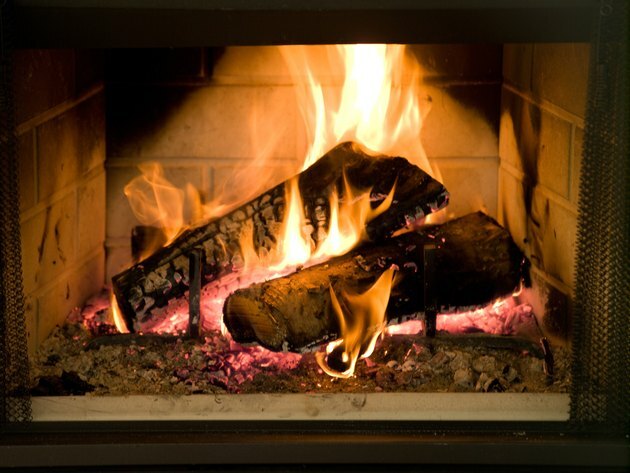 Protect the floor close to the fireplace with cardboard, newspaper or plastic bags. Use tape to secure the protection you chose for your belongings and floor. Remove the mantel in front of the fireplace with a pry bar. Pull slowly and carefully, and remove the mantel as a whole. This will prevent the brick from damaging. Place the mantel in another room. Locate the lintel of the fireplace -- a bar made of stone that supports the foundation. Proceed to knock down bricks with a hammer to make the opening of the fireplace bigger, leaving the lintel intact. Do not remove more than a few bricks on each side. Contact a contractor if you would like to move the lintel up or make the opening wider. Clean the area off bricks and sweep. Align the new mantel in front of the fireplace. Attach following the manufacturer's instructions, usually by using pegs and glue. How Do I Cover a Fireplace Opening?